We have now finished the first set of lessons—those from the actual story. You may want to reread the story to your children/students. The next set of lessons will be a little more detailed, and while they may appear repetitious, there will be new truths to learn in these lessons as well. How did life change after the “Ice Age” ended? 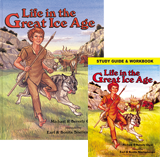 Discuss the climate changes that occurred between the first part of the Ice Age and the last part. What was the weather like where the Neanderthals lived? List several possible reasons why Neanderthals looked different from people today. What evidence exists that indicates today’s desert areas experienced more rainfall in the past? What materials did the people who lived during the Ice Age use to make jewelry? Several tools are mentioned in this week’s reading. Name three and draw them. Have you ever found an arrowhead? How do we know that Ice Age families lived in tent shelters in the caves? Using an atlas of the world (perhaps borrowed from your local library), locate the various places mentioned on pages 50 and 51 as you read this section with your child. “Painting materials and Techniques” explains how common resources were used for the art we find on cave walls. Have your child/student gather items such as red clay, charcoal, blueberries, strawberries, etc. and find out which can be used as “paint.” Use a sidewalk or driveway to test the “paint.” How long do the “pictures” last? If you don’t wish to leave pictures on the sidewalk or driveway, use heavy paper for the experiment. For older students: in Genesis 4:21 , and in many of the Psalms, musical instruments are mentioned. Make a list of the different types of instruments the Bible talks about. Sometimes Scripture gives a description of the various instruments—include this description in your list when possible.